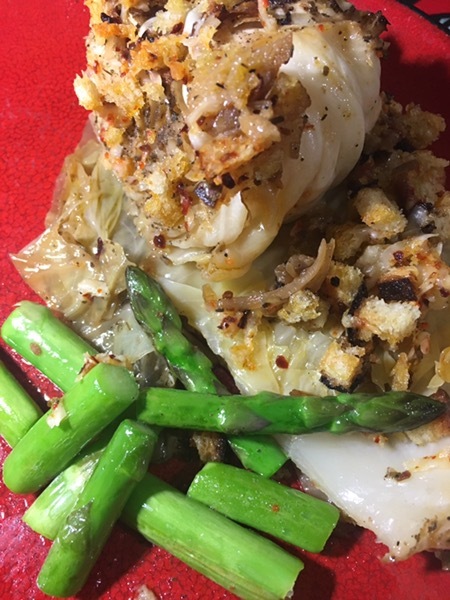 A change of season meal: Slow roasted cabbage with slightly steamed asparagus. It is the time of year when Winter vegetables are coming to an end and Spring ones are popping out. This results in crossover meals. Like this slow roasted cabbage (meltingly sweet and soft) with crispy fresh asparagus. * Cut the cabbage into quarters. Slice out the hard centre core. * Place each quarter on two strips of criss crossed foil. * Rub all over with butter and drizzle with olive oil. * Sprinkle the cut sides with Italian herbs, salt, pepper and garlic powder. * Wrap in the foil, leaving room for the cabbage to steam, and bake at 160° for about 2 to 2.5 hours. * Meanwhile, slice ciabatta into small cubes. Mix this with grated Parmesan, pul biber (Turkish red pepper) and oil. * Open the cabbage up, top with the ciabatta mix and bake at 180° until topping is crispy and just browned. * Serve with asparagus, steamed for a few minutes, drizzled with lemon butter.